This is just a simple guide, answering a few basic questions. Disclaimer: Let the buyer beware. Please do not hold me responsible if you have a bad experience with a cello purchase. I am merely giving some free advice and pointing you in the general direction in which to go. You must be responsible for your own actions and difficulties. I. How much money does a decent cello cost? First time buyers are shocked to find that even an inexpensive beginner's cello will cost about $1000.00 (to say nothing of the bow, which will cost at least several hundred dollars). It is possible to purchase a "toy cello" for about half that price, but they are stamped out of plywood, improperly glued and finished, with slipping tuning pegs. They sound about as good as a cigar box with rubber band strings. It is possible to purchase a plastic bow for about $40, but it would be better to get a genuine brazilwood or pernambuco bow that will give good response and service for years and years. A cello ought to be hand-carved maple and spruce, not plywood stamped-out by a giant machine. This is crucial for sound quality. It needs to be carefully glued together with the proper sort of glue, in case it needs to be taken apart for repairs some day. It should be finely varnished and pleasing to the eye. The fittings, especially the fingerboard and pegs, should be made of ebony or rosewood. I have seen fingerboards made of cheaper woods, stained or painted black. It is impossible to play, or learn to play properly with such an instrument, because of the additional friction between the painted fingerboard and the fingers of the left hand, especially as the cellist shifts from one position to another. The tuning pegs must be made of ebony, and precisely fitted, or the instrument will constantly slip out of tune. The angle of the fingerboard, the planing of the fingerboard under the C string, the precise placement of the nut, the bridge, and the height of the strings above the fingerboard are all crucial dimensions, and must be set-up by an expert, or the cello will be virtually unplayable. The bridge must be made of the proper grade of maple, properly cut with regard to the grain of the wood, and perfectly fitted to the belly of the cello. Inside the cello, the soundpost must be correctly fitted and positioned, and the bassbar (which one cannot see at all without opening up the cello) must be correctly positioned and glued to the belly of the cello. The strings must be of a decent quality, and of a character to fit the particular cello in question; and they must be accurately positioned on the bridge, with correct spacing and height. Cellos that come with a set of steel strings will need fine tuners installed on the tailpiece, and these need to be installed correctly. The endpin should be easily adjustable. Finally, there should be an overall aura of good craftsmanship. There is a difference between a cabinet maker and a carpenter. The construction of a stringed instrument must be done by a person who is even more detail minded than a cabinet maker, or the resulting instrument will not play well. The cello will not play well, and it will not sound good, unless all these things are done right. All of these factors make it necessary for a good beginner's cello to cost about $1000, minimum. The brand name is not a vital issue. There are probably some brands that should be avoided, but there are some brands that have been found generally reliable. Talk with the merchants I have listed at the bottom of this page about particular brands, and listen to what they tell you. Read the links on their websites. You will find much helpful information there. I received the following email about brands which is worth reading: "Perhaps some words concerning the origin of various cello brands would help the novice buyer. A lot of beginners are tempted by some of the offers on Ebay for cellos with nice German names that are really made in Hong Kong or Korea. I suspect that decent student cellos CAN come from these countries but a lot of junk too. My Stringworks artist cello was put together in Sri Lanka and I think it's a very good deal for the money." II. What Size Cello is Right for You? Cellos are available in a large range of sizes to fit the size of the cellist. My personal experience is that if you are taller than five feet, you will be able to use a full-size (4/4) cello. Cellists from four and a half feet up to five feet tall will feel comfortable with a 3/4 size cello. From four feet to four and a half feet, try a 1/2 size cello. Even smaller sizes are available. If you fall in the middle between two sizes, you will be more comfortable with the smaller size. The best way to determine the correct cello size is trial and error at a cello shop, just as you would try on clothing at a clothing store. Sit erectly on a chair of such a height that your feet can rest comfortably on the floor. Extend the endpin of the cello about 12 inches. Let the cello rest against your chest at about a 45 degree angle. 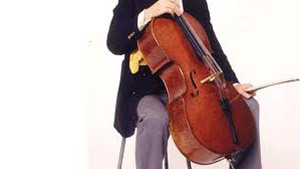 If the cello is the correct size, the top of the cello will rest in the middle of your chest, and the peg for the C string will be close to your left ear. Try cellos of various sizes until you get that sort of fit. If you purchase your cello by mail-order, buy two cellos of different sizes, try them on for size, and return the one that doesn't fit. Note: the correct size for you will also vary somewhat depending on the length of your arms, and the size of your hands and fingers. Obviously the person with longer arms and bigger hands will have less difficulty with a larger instrument. Click here to read an expert discussion of cello sizes from the ICS message boards. If at all possible (I cannot stress this too much!) you should not purchase a cello unless it has been examined and tested by your teacher (actually handled and played), or some other trusted "expert." $1000.00 is too much money to throw away on a mistake. Seek out a stringed instrument shop that has a large number of cellos of different price ranges actually there in the shop. Take your teacher with you. Try them out. Play on them. Decide together with your teacher which cello is right for you. It is very wise to rent a cello for six months or a year before making a purchase. Maybe you will lose interest in a few months. Maybe you will discover that you don't like that particular cello, and want to get a different one. Does the merchant you deal with have a "rent to own" arrangement? What about a "trade-in" at a future date for a better cello? Be a good business man or woman! Be a good shopper! After you receive your mail-order cello, look inside through the "f-hole" for a wooden soundpost under the left foot of the bridge. If you don't see it, don't tighten up the cello strings or attempt to play on your cello, as you may ruin it. The soundpost must be in position! If the strings loosened, and the bridge slipped off during shipping, you had better get an experienced cellist to put it back in the right way. The bridge should fit centrally between the notches on the f-holes, and should stand perpendicular to the cello. The feet of the bridge should fit perfectly flush to the belly of the cello. Best wishes, and Good Luck from drcello!